Slice the zucchini into 1/4-inch circles. Saute the chicken breasts in the olive oil for 2 to 3 minutes per side in a large saucepan or Dutch oven. Season with salt and pepper, then pour in the red cooking wine around the chicken. Add the sliced onion, sliced bell peppers, sliced zucchini, and shredded carrots over the top of the chicken. Then pour the crushed tomatoes over the top and add Italian seasoning. Reduce heat to low and let simmer for 10 to 15 minutes. 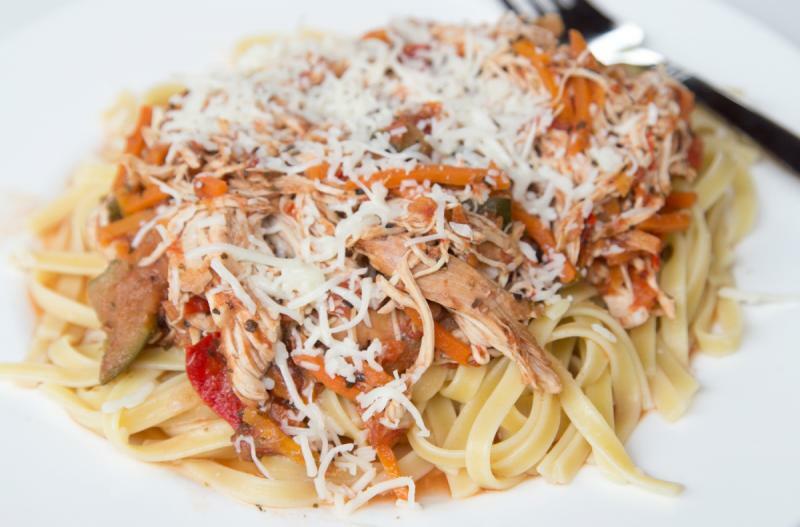 Serve Stovetop Chicken & Veggie Cacciatore over pasta with salad. Slice 2 zucchini into 1/4-inch circles. Put baggie in the freezer and freeze up to 6 months in fridge freezer or 12 months in a deep freezer. Thaw in the fridge overnight, or a warm bowl of water for about 20 minutes, before adding olive oil to saucepan or Dutch oven and cooking all ingredients together for 15 minutes, or until chicken is cooked through. Thaw and add olive oil to saucepan or Dutch oven, then add all ingredients to pan and cook for 15 minutes, or until chicken is cooked through.